Does anyone have any experience with this cheap little recorder? I’m travelling to Sri Lanka in March for a holiday and would love to capture some ambiences and other sounds. Don’t know exactly what yet. I do have a Sound Devices MixPre-6 but I’m reluctant to bring it with me as I imagine that a lot of accommodations we’ll be staying in won’t have safes and I won’t want it with me all the time. Also, it having no internal mics means I’d have to bring my Audio Technicas, which, again I’d rather not have just lying around when I don’t need them. Portable and all as my current setup is, I feel it’s not really suitable for this trip, so I was wondering would the Olympus do a reasonable job? Any alternatives that you would suggest? I really like how small the LS-P4 is - it’s tiny! I could keep it in my pocket with me at all times. I’d be grateful for any feedback. EDIT: the review is a little light on the use in practise side of things so any more i fo will be gratefully received. Another thought: I will be bringing my Android phone with me (Samsung Galaxy S8). Maybe there is something useful I could get for that? I bought one specifically because when out for a day, Mrs S would sometimes get a little tetchy if I sallied forth with my Zoom F4, recorder bag, headphones, NTG4+, Rode Blimp, and Rode microboom! Just to make clear... we do have occasional recording/photo days when I go festooned with the aforementioned gear and she goes festooned with DSLRs and lenses! Thanks Mike, I was hoping you’d respond. Which Tascam do you use? 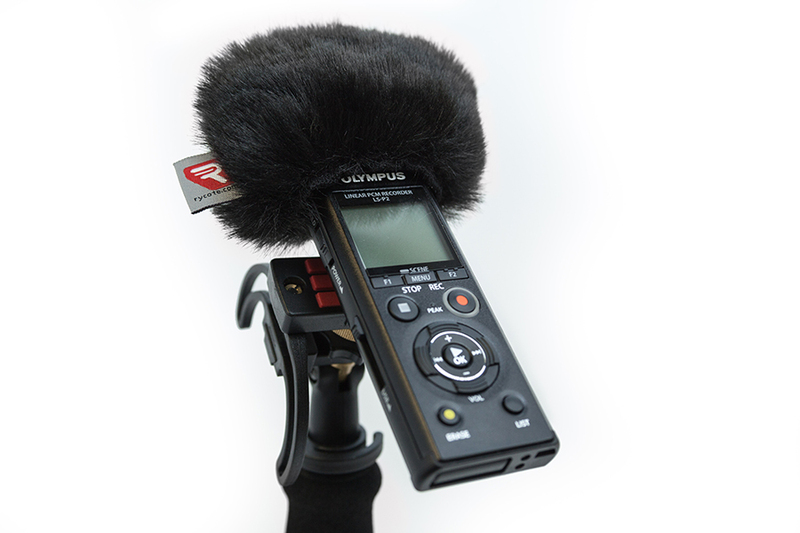 You could try one of these: https://www.zoom.co.jp/products/field-v ... valier-mic with one of the clip-on add-on mics. I had the XY mic set-up and was impressed with the quality. A friend I trust reviewed these and also the equivalent Tascam recorder. Much preferred the Zoom for quality of recording and ease of use IIRC. I've also got a Tascam DR-03... long discontinued, but very small... easily fits in a shirt pocket. I've used that for radio interviews many times. Fine as long as the levels are good - neither hot nor cold. Got it as an end-of-line from bhp in New York - equiv of £45 with 3-year warranty! I use the older but very similar LS-11 for the same kind of ambient recording, and it is actually remarkably good provided you take care with setting the record levels (headroom is your friend!). I recorded a Lancaster bomber engine start-up sequence with it a couple of years ago, and the recording still gives me goose-bumps! I would, however, strongly recommend that you invest in a Rycote location recorder kit comprising a handle, shock-mount, and windjammer -- the kit makes a MASSIVE improvement to the machine's use when outdoors! it's £100 very well spent! Hugh Robjohns wrote: I would, however, strongly recommend that you invest in a Rycote location recorder kit comprising a handle, shock-mount, and windjammer -- the kit makes a MASSIVE improvement to the machine's use when outdoors! it's £30 very well spent! Errmm... more like £90 these days Hugh, unless you have a secret source! I have the LS-P2 and it’s tiny! Very workable for quick takes and reasonable quality for what it is. The 3 mic configuration works reasonably well with the centre Omni giving you a little more bottom end than you might otherwise expect. As Hugh says, you need some sort of wind protection. I use a botched something or other and a miniature camera tripod. oops -- sorry. Typo corrected! Another thought if you’re an iPhone user is the Shure MV88. This microphone is as good as any I’ve found on the portable recorders I’ve used. M/S with lots of width options using the rather good APP. Nice case with foam sock over which you can pop a generic fur ball. Bob Bickerton wrote: Another thought if you’re an iPhone user is the Shure MV88. Thanks for the suggestions guys. I’m currently mulling it over. Do you have suitable Mulling Atire? Mulling complete.... Olympus LS-P4 + Rycote windjammer ordered. I couldn't find the kit that you linked to Hugh for sale anywhere. I don't plan on using the recorder handheld much anyway. I'll most likely use it with a 'gorilla pod'-style tripod and attach it to whatever is to hand. Dan LB wrote: I couldn't find the kit that you linked to Hugh for sale anywhere. It's on the Rycote website so it must exist... If in doubt, a quick call to Rycote would sort a solution -- they are extremely helpful people. That’s what I’ve ordered Wonks. It’s the *kit* with the shockmount that I cant find. Not a problem for now. First impressions of the recorder are very positive. It’s absolutely tiny!! Sounds pretty good for what it is and I think it will be useful to have around. Obviously it doesn’t compete with my Sound Devices/Audio Technica rig but it’s decent enough for the money. The menu system is quite straight forward and I haven’t needed to open the manual yet. Overall, I’m a happy camper so thank you everyone for your input. I love this place! !